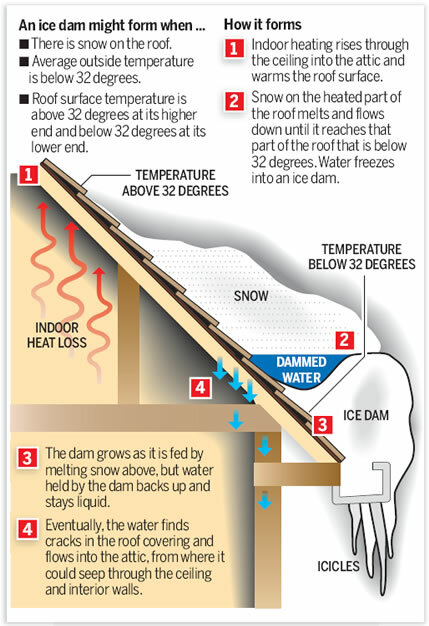 Figures below are a Cross section of a one-and-a-half story house with an ice dam. There is a complex interaction among the amount of heat loss from a house, snow cover, and outside temperatures that leads to ice dam formation. For ice dams to form there must be snow on the roof, and, at the same time, higher portions of the roof's outside surface must be above 32° F while lower surfaces are below 32°F. For a portion of the roof to be below 32°F, outside temperatures must also be below 32°F. When we say temperatures above or below 32°F, we are talking about average temperature over sustained periods of time. Non-uniform roof surface temperatures lead to ice dams. There is another type of convection that transfers heat to the attic space and warms the roof. In the figure above, the winding arrow beginning inside the house and going through the penetration in the ceiling, from the light to the attic space, illustrates heat loss by air leakage. In many homes this is the major mode of heat transfer that leads to the formation of ice dams. Photograph 1 shows a single story house with an ice dam. The points of heat loss can be clearly seen as those areas with no snow. The ceiling below this area needs to be examined for air leakage, missing or inadequate insulation, leaky or poorly insulated ductwork, and the termination of a kitchen or bathroom exhaust into the attic space. Photograph 1. A single-story house with an ice dam. The areas without snow are the points of heat loss. Photograph 2 illustrates unusually high heat loss from the roof. There is very little snow left on the roof and at its edge is both an ice dam and a "beautiful" row of icicles. Photograph 2. The unusually high heat loss on this roof has caused both an ice dam and icicles. So it is primarily heat flowing from the house that is causing the non-uniform temperatures of the roof surface leading to ice dams. In all New York communities it is possible to find homes that do not have ice dams. Ice dams can be prevented by controlling the heat loss from the home. Increase the ceiling/roof insulation to cut down on heat loss by conduction. State code requires an R-value of 38 above the ceiling for new homes. In narrow spaces, use insulation products with high R-value (6-7) per inch. Weatherization contractors, who may be listed under Energy Management and Conservation Consultants or Insulation Contractors in the Yellow Pages, are professionals who can deal with the heat transfer problem that creates ice dams. A blower door test should be used by the contractor you hire to evaluate the air tightness of your ceiling. In addition, they may have an infrared camera that can be used to find places in the ceiling where there is excessive heat loss.